A few days ago, I watched an America’s Test Kitchen TV that had been broadcast the previous week (while I was still watching the Winter Olympics). Episode #1407 according to my TiVo, it was entited Salmon and Latkes, and the first recipe they did looked very familiar — it was the same herb-crusted salmon ($) from the May, 2013, Cook’s Illustrated as I had done for my parents last summer. It has all the hallmarks of a typical Test Kitchen recipe: brining, par-cooking some ingredients to ensure the correct finished texture, unusual pan preparation, and a temperature reading for doneness. I remembered having liked how it came out, so I decided to do it again. This is the first significant bit of cooking I’ve done since my parents packed up and left for the west coast. I was pleasantly surprised to find that the salmon fillet I had bought was already pinboned; usually I buy wild salmon, which never is in my experience, but for this recipe a thicker fillet was called for, and that meant farm-raised Atlantic salmon. (In any event, the flavor of wild, Pacific salmon is quite delicate, and would be smothered under all the herbage in this recipe.) 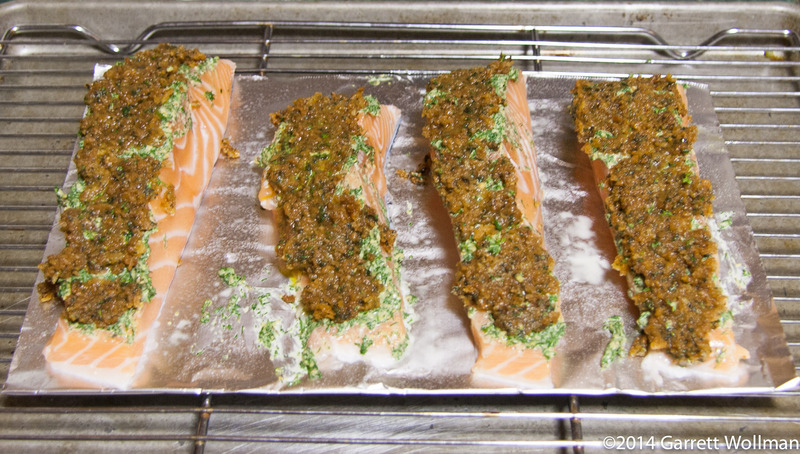 The salmon is portioned into four (hopefully) equal pieces and brined for 15 minutes for seasoning. The recipe calls for fresh tarragon as the principal herb flavor, but basil and dill can also be used; I chose to use dill this time around, having done tarragon back in the summer. (There is also thyme in the crust.) I made one measurement mistake, using only 1/3 cup of panko rather than the 1/2 cup the recipe calls for; I blame the poor lighting in my kitchen. Despite this, there was nearly enough of the crust material anyway. The recipe calls for pre-browning the panko in a skillet with melted butter, which ensures that the crust is brown and crisp without using the broiler, which would overcook the fish. 1Note well: Does not include sodium absorbed from brine, which can only be determined by laboratory analysis. 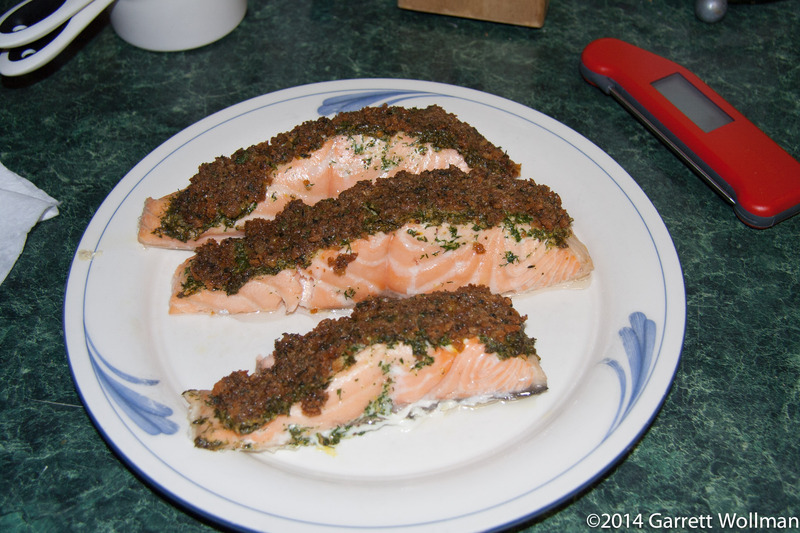 This entry was posted in Food and tagged America's Test Kitchen, Cook's Illustrated, recipe, salmon. Bookmark the permalink. Reheat update: I found the best bet for reheating the salmon was to put it on a dinner plate, cover with a paper towel, and then microwave for five minutes on 10% power. If it’s not hot enough, zap on high for five-second increments until ready. The crust suffers, of course.